Sometimes I make silly things that are just for me... these plant pots were demo pots made while teaching youth and adult handbuilding in the spring at the Art Association. The submarine started out like a regular pot, then transformed into something truly silly that I couldn't wait to get into my garden! The whale came along second as a response to the submarine. It might be rare that I have an excuse to use a cake stand, but it's fun to use them! And I do think they get sad when they go too long without cake (oh, and I get sad too.) This cookies & cream icebox cake was extra yummy since the cake stand was involved! Sometimes cake stands crack in the kiln- in my garden those turn into plant stands. I have a few more silly things at work in the studio- starry garlands for my art fair booth and a sea monster paint brush holder... I'm looking forward to putting these to use soon! I have been working on custom pottery for The Restaurant at The White Buffalo Club in Jackson for over a year. This is the first in a series of big orders and even though it still seems like it takes me a long time to finish anything- I can tell that I've gotten faster and more consistent thanks to this project! 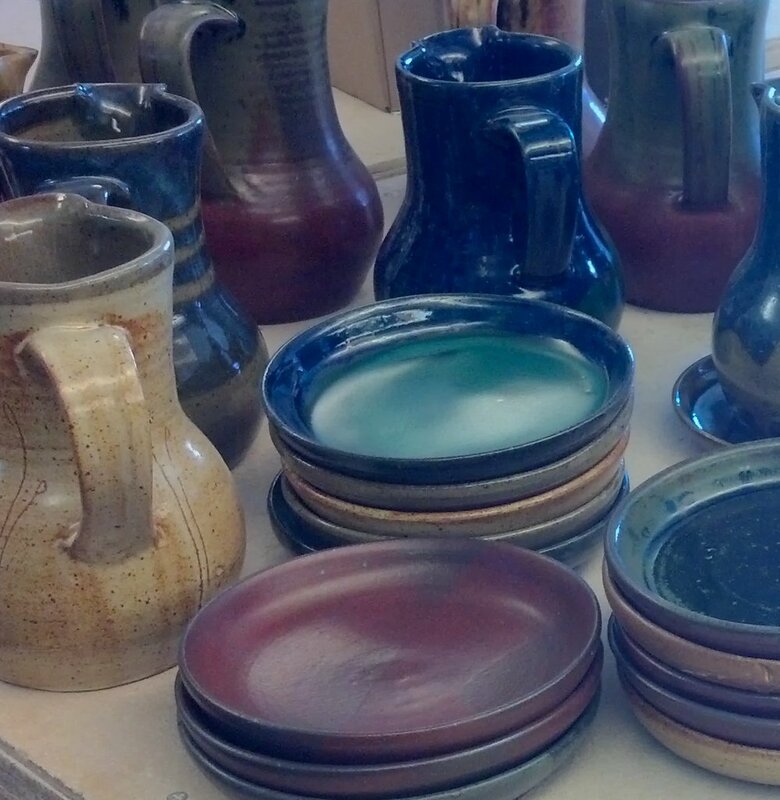 At the start I met with Chef Joel Hammond to discuss plate forms and glaze colors. We started out with 1 bowl and 3 plate forms with 3 different glazes. Since completing these, we've started adding specialized plates and ramekins. The speckles and satin earth tone glazes really fit the theme that Chef Joel has created at the White Buffalo Club. He sources local and regional products that highlight small ranches and farms. This extends to local handmade products- not just pottery, also the tables in the restaurant! 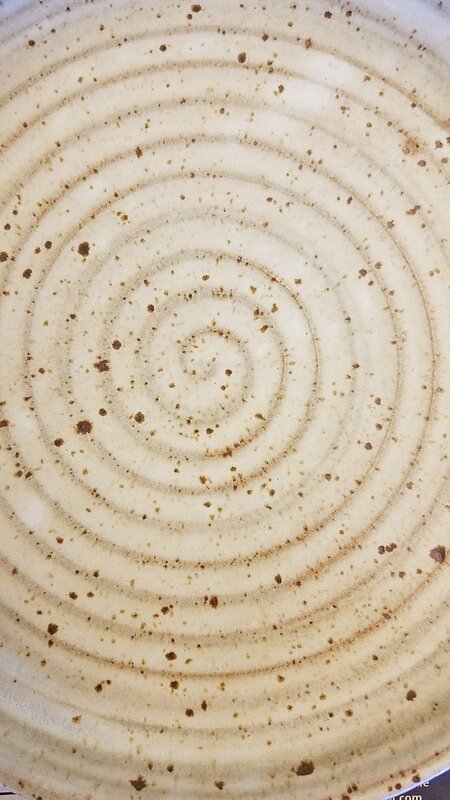 One plate form was totally new for me, a shallow flat plate with straight sides. While making the form was simple, I wanted to also ensure that the plates stacked well- imagining a busy kitchen. 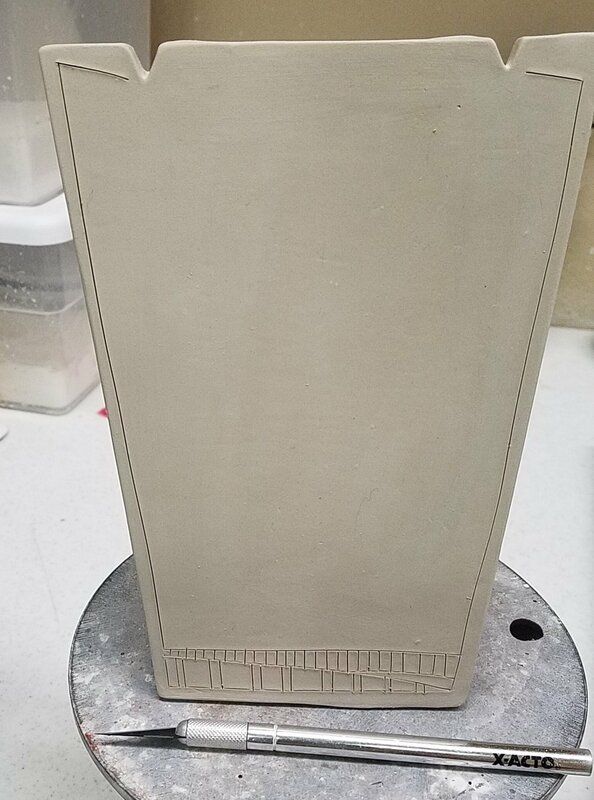 I came up with a simple solution to bevel the bottom edge- so each plate fits slightly inside of the plate it is on top of. Working with chefs to create custom dishes to support their vision has quickly become one of my favorite parts of being a potter. 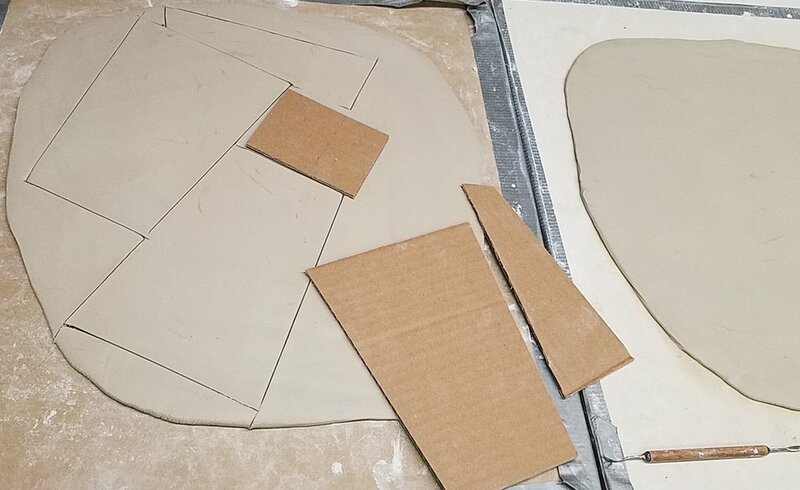 Joel came by the studio one day to try out an idea- I made a deep wide bowl and he pressed in and shaped the side... now I'm replicating this form and I can't wait to see what will go in it! I am also currently working on a specialized steak plate. So stay tuned, there is much more to come. Better yet, make time for dinner- The Restaurant at The White Buffalo Club re-opened May 11 for the season, so stop by to see what's new! For the past year I have been making pottery for Healthy Being Juicery in Jackson. The shop features my handmade mugs, bowls, teapots and cups with saucers along with cookbooks, teas, and snacks. My large salad bowls are also used in the cafe for serving beautiful, tasty, and nutritious salads. 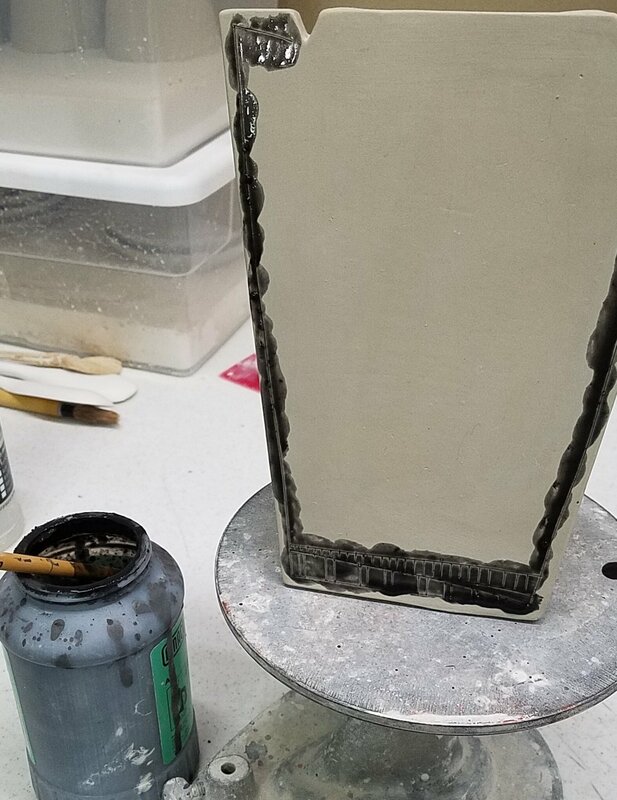 I love seeing my pottery in action and I also enjoy the opportunity to create something specific to embrace the spirit of a store or restaurant. In each location the process and outcome is different, but each starts with a conversation. I love making items to compliment the healthy and delicious lifestyle the juicery promotes. This Friday in celebration of Healthy Being Juicery's 5 Year Anniversary, they are throwing a party! Be sure to stop by for yummy treats, shopping deals, and say hi to their potter... me! For more details, check out the Facebook invite! As a potter I make dishes that are meant to be used daily. These items add something special to our daily rituals. And it's a tough job but someone has to make sure that everything works. 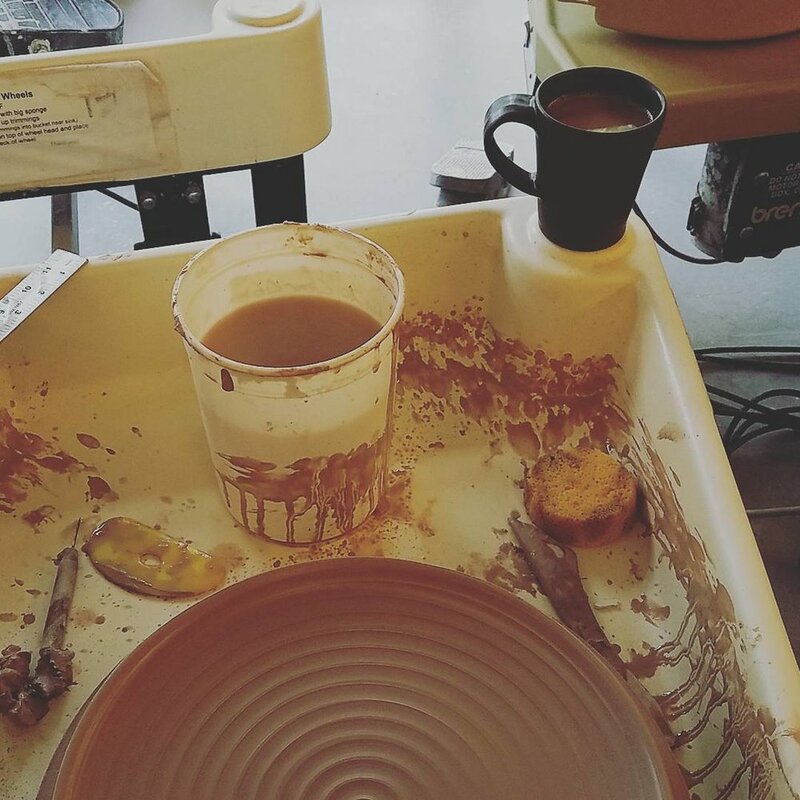 So have no doubt, I test my pottery thoroughly. Will this little plate hold cookies? How many? Even if they are warm from the oven? Wine cups. Yes, but do they work? 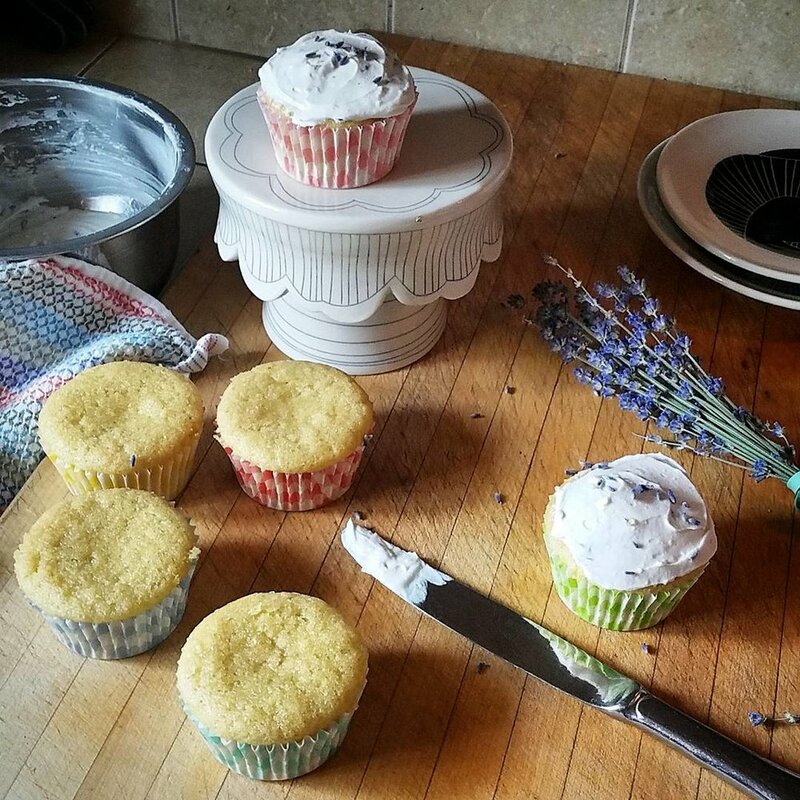 I lost some sleep worrying over this one, but rest assured, when I finally settled on a vanilla lavender cupcake- I meticulously tested the cupcake stand. In fact, it worked so well the poor little cupcake didn't even make it off the stand. I work hard to make the pots and will continue to make sure they work, it's a difficult job, but I'm up for the challenge! Since 2011 I have been making stoneware water pitchers for the rooms in the historic Wort Hotel in Jackson, WY. Yesterday I delivered a new batch for the Silver Dollar Mercantile near the lobby of the hotel. This has been my longest account and I'm happy to have my pitchers featured in the rooms while encouraging less use of plastic water bottles. The pitchers and saucers are wheel thrown from stoneware. I usually make them in the ceramics studio at the Art Association where they are also fired in the gas kiln. The Art Association is just down the street from the Wort, so when they are ready I put them on a cart and push it down Glenwood Street. I love deliveries in a small town! 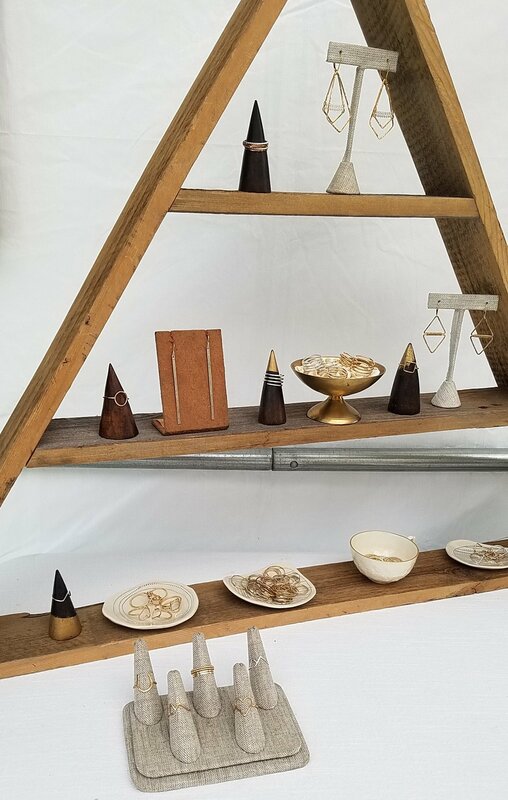 Just about 2 years ago I had an opportunity that not only changed the way I look at my pottery and how I view myself as a potter but has also opened doors to many more opportunities. In January of 2015 I met Chef René Stein. He had a vision to create a series of pop-up dinners in Jackson, WY during that winter and spring. Not only was he sourcing local ingredients right down to the salt, creating parings with local wines but he was also looking for local pottery to serve on. After a studio visit, where I was delighted to learn that he was not looking for white dishes, I put together sets of my black & white sgraffito porcelain ware, thinking that this might be a one-time thing. Luckily, I couldn't have been more wrong. 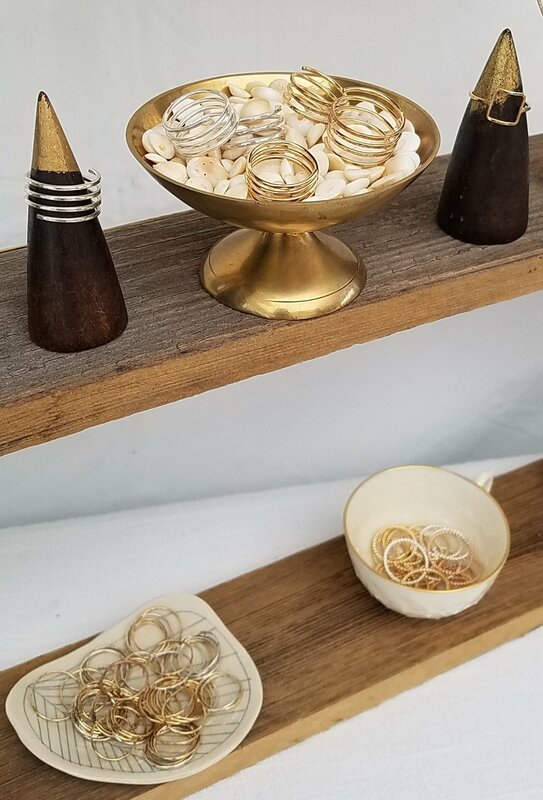 The first event, Pioneer Pop-Up, was held at the Ringholz Gallery just off the square in Jackson. It was amazing with every detail beautifully realized. After a series of pop-up dinners and a wonderful buzz through our community, René became the Executive Chef at The Rose. The magic continued at The Rose, where my black & white plates became part of every special dinner, an evening of 3 - 7 delicious, locally sourced and creative courses. René brought me requests for dishes: super flat plates, wide pasta bowls, wide based soup bowls as well as ideas for glaze colors. In the summer of 2015 I made a set of shino glazed plates, bowls and cups (in the photo above and to the left.) Shino glazes are notoriously active and hard to predict, the recipe I used could range from orange to white to charcoal to gold. It made me so happy to see how such an active glaze surface could also be activated and complimented by artistic ingredients and arrangements. 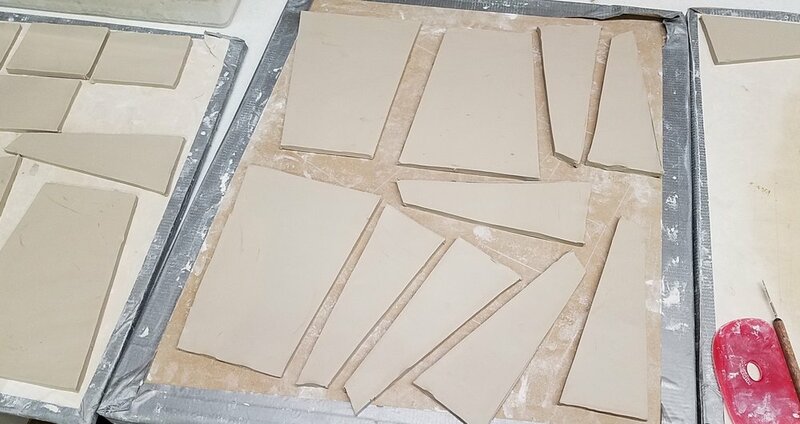 I learned a different way to look at form; very flat plates being good for meat dishes, wider based soup bowls that would be better for plating. 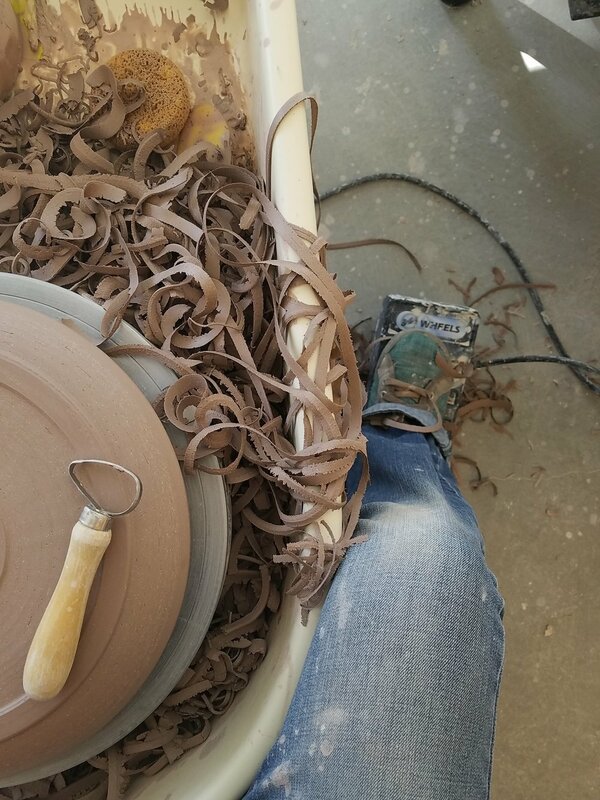 Bowls that have very high sides can be difficult to see into once sat on a table... all the little things that I add to my list of "observations that make for highly functional and pleasing pottery." This summer I made a series of wide pasta bowls and plates with a curved rim, glazed in snowy satiny white and charcoal. I've enjoyed seeing how René embraces mixing and matching the designs and forms, finding just the right compliment to his creation. The plates may be pretty on their own, but I think they come to life once food touches the surface. These photos are from a special dinner held last weekend in the gallery of the Art Association. It is a special experience to be present while Chef René is in his element. René and his family are soon headed to Germany for his next culinary adventure. While I will miss his style, I am grateful for this opportunity that sparked an excitement to be a potter at just the time I needed it most. Last night Sam and I enjoyed a final meal at The Rose with Chef René at the helm. What a treat! While I eat off of handmade dishes at home (a collection of many potters, a few of mine and a few of Sam's) it is truly an honor to be served from my own collection. It is also a humbling experience that has solidified my desire as a potter to enhance these daily rituals and continue to learn. If you are in Jackson or planning to be in the area, I highly recommend treating yourself to a meal at The Rose, where René's vision will continue and my dishes live happily. Stay tuned, this series has only just begun!